MET Institute of Mass Media (MET IMM) recently conducted its 5th Annual HR Meet. 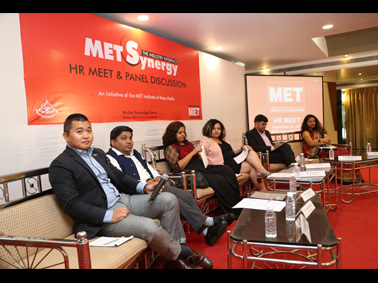 MET Synergy 2018 was a grand success and it witnessed participation from major Media Organizations. 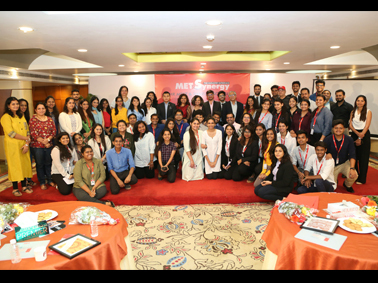 Media stalwarts such as MullenLowe Lintas, Wizcraft Entertainment Hungama Digital Perfect Relations WAT Consult Indiacast Media Triton Communications YOUME AND WE PR 9X Media were all present from this amazing interaction between the HR. Our HR panelists consisted of Mustafa Merchant (Times Television Network), Ami Mehta (9X Media), Amruta Patil (Endemol India), Jyoti Panda (Ultra Entertainment), Elson Sequira	(Iprospect, Denstu Ageis Network), PB Lalrinchhana (Viacom 18), Rajkamal Pandey (Adfactors PR)-Panel Discussion Moderator). The panel discussion was on the topic of “Dynamic of Media Hiring” which discussed in detail the opportunities and problems in the world of Media jobs. Then, HR panelist took questions from the students of PG in Advertising, Journalism, Entertainment, Public Relations and Digital Marketing. They gave them tips about how to apply for a correct job, the skills required in every media organization etc. The PG students of Mass Media were extremely happy to interact with the HR’s and had a truly great learning experience.